If you tuned in yesterday and over the weekend, you know I’m sort of on a beauty tech kick. 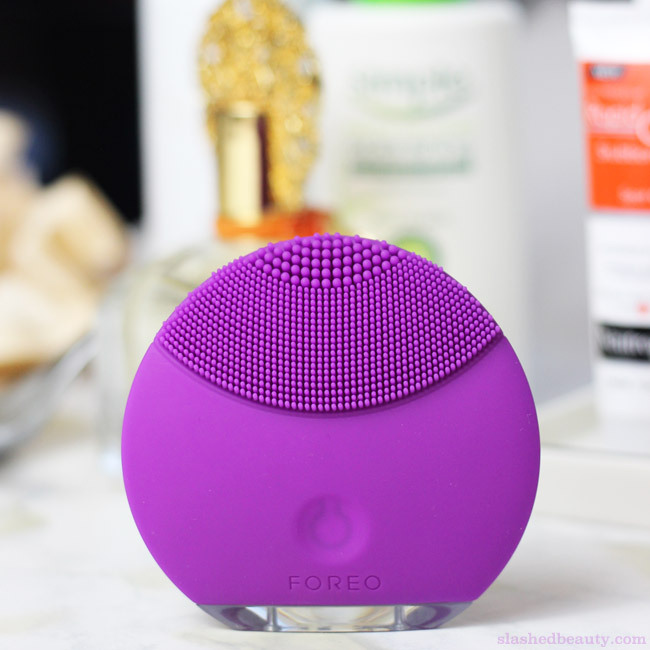 I was really excited to see the brand FOREO at in Vegas at CES, since their LUNA mini is my all time favorite face cleansing tool. I realized that I had never actually shared my thoughts on it with you here, and I honestly can’t believe it took me this long. For years, I was all about brush cleansers. At the time, Clarisonic was the “It” device in cleansing and I tried knock offs of the brush from a slew of brands. 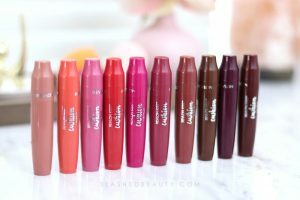 The one I had liked best— and used the longest— was the Pulsaderm, since the brush vibrates instead of spins. Still, there were days where it felt too rough. Plus, to add insult to injury, most of these brush cleansers were expensive to begin with, then require replacements of the heads every three or so months. That can rack up. 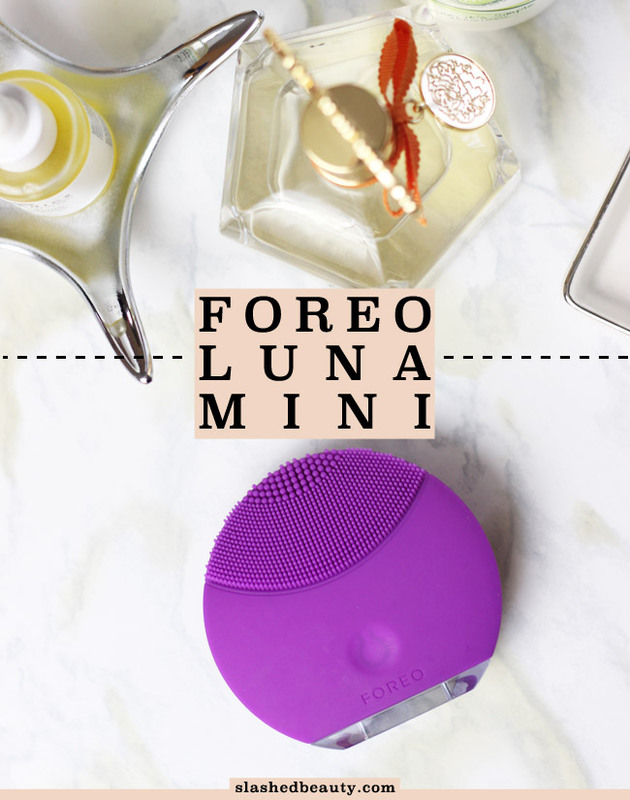 So one day, the FOREO LUNA mini showed up at my door. 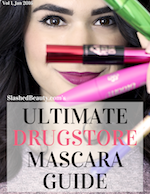 I had read about it on my usual beauty blog circuit and there were several things that had me thinking it might be a better fit in my routine. For one, the silicone bristles seemed more gentle than a brush. Gentle was exactly what I needed after the most unusual flare up of eczema happened all over my face this season. On top of that, you never have to worry about replacing anything. The silicone material on the device is antibacterial and antimicrobial, and can last you a lifetime when taken care of. And so, I opened it up and charged it so I could use it that same night. The LUNA mini has two sides: the front has mostly short, slightly flexible bristles for general cleansing, with a few large touch-points gathered at the tip to help reach crevices. The back has only the larger size, which are stiffer, for deep pore cleansing. Using T-Sonic pulsations, the LUNA mini can remove 99.5% of dirt and oil while gently exfoliating your skin. There are two speeds on the mini. I usually keep it on the top speed, which is still pretty gentle, but will bump it down if I’m having a particularly sensitive day or around problem areas. After I used the device for the first time, I literally took to Facebook to share my amazement. My skin never felt softer in my entire life than after just that one use. It felt like my first time ever actually getting a good cleanse and exfoliation, which is crazy because it is so gentle to the touch. I had no irritation, and my problem areas actually looked instantly more calm. A quick swipe of micellar water showed that I had, in fact, gotten all the dirt off my face with just my normal Simple Moisturizing Facial Wash and the LUNA mini. Something that made me love it even more: it’s extremely easy to care for, only needing a rinse with hot water and hand soap after use. With brush cleansers, I always had to put in elbow grease to get the makeup out of the bristles… ain’t nobody got time for that! The LUNA mini really helped streamline my routine and makes cleansing an enjoyable part of my skin care regimen. Oh… and I haven’t charged it since the first time I opened it. It’s been like three months and I’m using it twice a day… so that’s a thing. 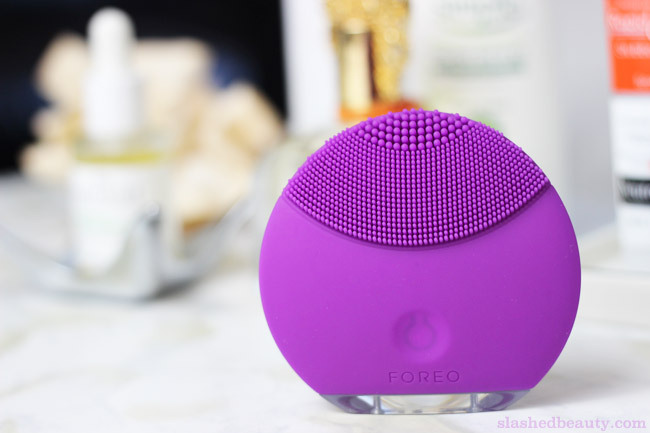 Being the “smaller” version to the original full-size FOREO LUNA, it’s also more affordable. While the full-size is around $170, the mini will only run you $99 at Sephora. Like I said, this is a steal considering you never have to buy replacements or accessories for the device. It’s also my opinion that the mini is actually a lot easier to use and more comfortable in the hand than the full-size LUNA, which is larger overall (it’s also a better option for traveling). Plus, the full-size device only has one side of cleansing bristles, while the other side has ridges that offer an anti-aging massage. Not necessarily what I need for my routine right now, so the mini is perfect. With that said, if you watched my Beauty Tech at CES vlog, then you know that they just released the LUNA 2 and LUNA mini 2, which have a larger surface area, 8 speed options, and longer touch-points (by 26%!) which have more flexibility to prevent pulling of the skin while cleansing. The longer bristles also help to reach every corner of the face. The new device itself has double the power, and so is supposedly more efficient at lifting impurities from the pores. Perhaps in the future I can do a comparison of the two more in-depth, but for now the first LUNA mini is getting the job done better than anything else I’ve tried, and I’m extremely happy with it. My closing argument: don’t spend your money on an expensive brush that will keep you spending money every few months. With the LUNA, it’s one-and-done… and your skin will thank you. Even my most inexpensive skincare products are working better, my skin is looking better, it’s just… better. Are you currently using a face cleansing device? Tell me which one in the comments! 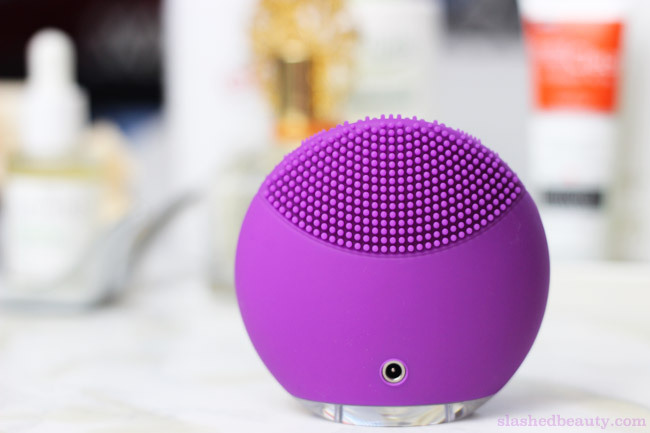 thanks for your post 🙂 I’ve been using foreo luna mini 2 for past few months and i am still in love with it every day! Hi, I am thinking I should buy mini 1 or 2，Its a difficult choice .its around a $20-30 difference of them. For daily use and I am senstitive skin , which version will you suggest? I would suggest getting the mini 2 if you have really sensitive skin– there are 6 more speed options so you can really customize it to what works with your skin. The mini 1 only has two speed options so if either of them are too harsh/not effective, it’ll be a bummer. I haven’t tried the mini, but I love my Luna. I was surprised at the difference using my Clinique sonic cleanser made, too. It’s makes my Luna feel even softer on my skin, but still cleans really well. Awesome! yes and FOREO just came out with cleansers too which I’m curious to try! I used to have a normal-sized one and I loved it! Until I forgot it on holiday, ugh… Maybe I should get myself a mini now. OMG I can’t imagine leaving it somewhere. Yes, now would be a great time to get a mini! I bought the Anself dupe from Amazon for $19 with Prime shipping. It arrived yesterday and I used it last night, LOVE it. From what I can tell it’s basically the same gadget, the nubby pattern is a little different but it’s just as effective and gentle. That’s awesome, Saramel! Thanks for the dupe alert, I’ll have to check that one out… can’t beat the price! I’m very curious to see if I could get my hands on this, I’ve been hearing rave review after rave review for the Clarisonic,but this seems like a better deal in some ways, and with my acne prone skin, I’d want to get all my bang for my buck. Thing is I would love to try this out, before possibly purchasing it I’ve been looking at it for some time now. I like how it is different from the clearsonic is you don’t have to replace the heads or buy extra brush heads.The only thing that I can’t get pass this is the price in canada it’s $119 for the mini, I would love to try this but the price is something that makes me not want to try it you know..? Thanks for more info about this product, I may go chat with the ladies at Sephora to get more info. Right now I just use my hands to wash my face, nothing to crazy. i’m not worried about the silicon feel but mostly the price… and that silicon scrubby that is $6 S $8 in Canada. That’s the down size of living in Canada and if I were to order it online it would be triple the price with shipping and handling. Im thinking on going in an asking the Sephora girls more about this !! You definitely should. Worst comes to worst, I don’t know about Canada Sephora but here in the US they have a no-questions-asked return policy on nearly everything, even if you used it! I’ll be defiantly looking into this, I’ve been looking at it for some time now. Specially when it kinda beats out the Clearsonic, it’s more realistic, that you don’t have to buy the heads to go on the machine that cost you $200+ or so. Thanks for the info Ill look into or return policy. Yay! Can’t wait to hear your thoughts.